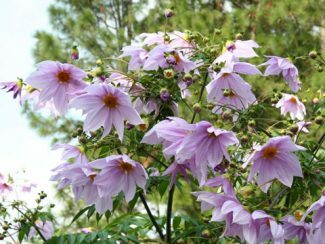 Originally cultivated by the Aztecs in Mexico, the Dahlia is a member of the Asteraceae family. Dahlia imperialis grows up to 10 metres and is native to Mexico and Central American uplands. The flower-heads are 75-150mm across, lavender or mauvish-pink in colour. The long canes, Nick told us, could be used by hunters to carry water. D. pinnata and D. coccinea were two of the three sent from Mexico to a Spanish botanist, Antonio José Cavanilles in Madrid at the end of the 18th century. From these have come 57,000 named varieties. Having more chromosomes than other plants allows a wide range of breeding from a limited gene pool. They are named after Anders (Andreas) Dahl 1751 – 1789, a leading Swedish botanist and student of Linnaeus. We got several hot tips, including the “go-to” supplier; key requirements for successful dahlia growing, propagation and over-winter storage. Importantly, we also heard a low cost and safe cure for mildewed leaves, i.e. 2 teaspoons of baking soda in 1 pt of water sprayed direct onto the leaves. The HGA was recognised by the presenter as unusually healthy in number and enthusiasm; and after the tea break, the appreciative audience went on to ask searching and far-ranging questions of our expert speaker. An excellent time was had by all.